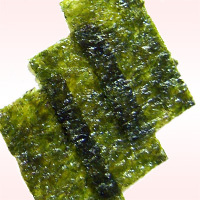 Seasoned Nori is dried seaweed with added flavors such as Soy Sauce or Sugar. Original base is Nori. Dried seaweed coated with sauce is often seen used in making Onigiri rice balls in the West region of Japan(Kansai). The nutrition value found in 1 pack (3g) is 5.4 calories, 1.2g of protein, and 0.1g of sodium. Baked nori seaweed 1 pack (2g) par 3.8 calories with 0.8g of protein and 0.0g of sodium. It is often sited on recipes sites as being used in toast, soup, tempura, bread, and Pasta. The calories in Seasoned Nori per 3g(1bag containing 8 sheets) is 5 calories. Seasoned Nori is calculated to be 179Cal per 100 grams making 80Cal equivalent to 44.69g with 1.25g of mostly carbohydrates、1.2g of protein、0.11g of fat in 3g while being rich in vitamins and minerals such as Vitamin B12 and Vitamin K.